Carmen Duarte was born and raised in the south side of Tucson in 1956. To this day, she is a proud resident of the area. During this workshop, she reminisced with the students about her youth, and how her mother always advised her to strive to be as educated as possible, always try her hardest, and be proud of whatever she accomplished. 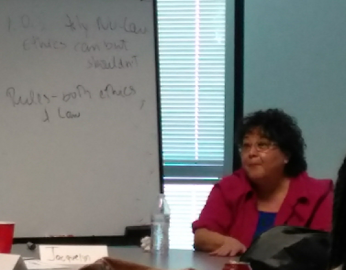 Duarte attended St. John the Evangelist Catholic School, and continued her education to Pueblo Magnet High School. When professor Ralph Chavez spoke to her school about journalism programs, she began to think about studying it in college. Upon graduating high school in 1974, she was accepted with scholarships and work-study programs at the University of Arizona. It was at this time that she was convinced journalism was her passion, and something she wanted to continue as her career. Carmen Duarte is now a valued reporter for the Arizona Daily Star, and she has come to hold her profession to the highest level of importance. She enjoys to cover a variety or stories, however she frequently covers stories regarding deaths and new laws. Duarte finds it remarkable just how emotional and personal her interviews can become when they reach certain, often somewhat traumatic topics. Getting people to be open with their feelings and experiences, though often difficult, is something she has found to be of immense empowerment and beauty. “You can’t force people to talk to you, and you have to respect their wishes. You ask, and if they say no, you respect that and you leave. Many people don’t talk right away, they may tell you to come back in a couple days, or call you… and when they do…it’s like a cleansing for them, when they can open their deepest sorrows and it helps them talk about it. Some of the hardest experiences they’ve lived through, in talking about it, they’re often letting go of some of that pain,” Duarte explained. Her stories truly are inspirational and even come to teach her important lessons. One example was of a tragic story a mother told of her teenage son, who was killed in a collision with an intoxicated driver. This led her to consider the implications of her own instances when she wasn’t driving with full attention. She continues to put her all into her craft, one of putting the truth of matters out for the public to know. Duarte continues, through her down-to-earth personality and great kindness, touch many hearts in the process. ​Today was a bit slower in terms of pacing. We got to the meeting area this morning and were back to working on our stories again. Kenzel and I conducted an interview by phone in the morning with one of the students involved with the LGBTQ+ Affairs committee here at the University, and he had quite some experiences and insight to share. This was quickly blown out of the water, however, when we went down to the Confluencenter on campus to interview professor Javier Duran. Boy, he was quite the interesting person, and he taught us quite a bit about the community’s experiences with the school, and where he believed LGBTQ+ progress was headed. We continued to work on our stories, and have heard back from more sources for later. It will be an exciting experience as we progress for sure, on our stories. ​Today we began learning the major ins and outs of just what journalism is: how it should be defined and the true level of importance it holds in today’s world. The mentors brought several accredited speakers from the local journalism sphere to give several lectures, all of which were very interesting! Journalism was given a greater priority in terms of what was talked about. We learned a lot! I also got the chance to interview Arizona Daily Star reporter Carmen Duarte, who was really sweet and inspirational in the story she gave. Then, we began contacting sources for interviews, which, while somewhat unnerving, was really exciting. I hope we can get a great story (as Kenzel is working with a very similar topic). ​This has been the first taste of the journalism program for me, and it’s really cool! After extensively packing, I went to the opening having no idea what to expect. The talk with Frank Sotomayor, as well as the discussion with mentors and fellow students, were awesome! The stories told were really something! It was great, not only to receive insight by the mentors on my own ideas, but to hear those that the other students had. We had a pretty fun outing to 4th Avenue to practice our photography skills before heading back for some final advice about the rest of our stay. It’s a really interesting experience! Ray is an incoming senior at University High School, and came to really enjoy the experience of this workshop, through the media work and the process of putting the stories together through the journalism processes.